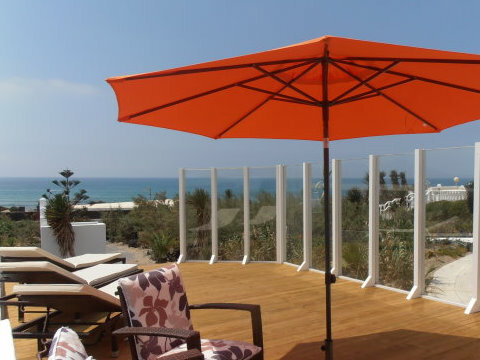 Now with a new, big sun terrace with beautiful sea views ! In the so-called „Norwegian Settlement“, a small urbanisation directly at Famara Beach, you will find the Apartment da Vinci. It is part of a about 1.500m2 property which includes another apartment as well as the owners house. 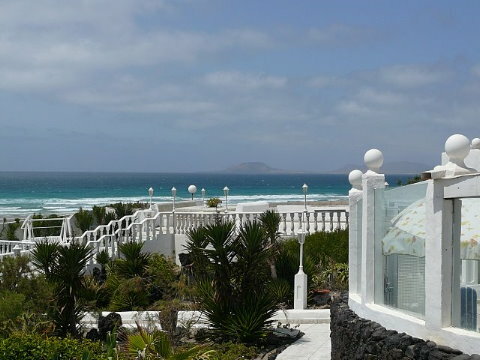 Famara Beach is one of the most beautiful beaches of Lanzarote and it is only 100 meters away. 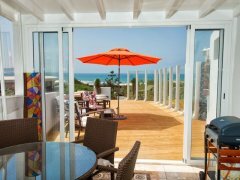 And from the terrace you have a fantastic view to the beach and the Atlantic Ocean with magnificent impressions of sunset! You get to the apartment through its own patio where you find as well a small, heightened terrace. From here you reach an exquisitely furnished living room with integrated dining space at the patio window. As well you have a cosy bedroom (with extra-TV) with a nice king-sized bed. Furthermore there is another small single-bedroom, and the small „office“ where a child could sleep on the couch. But there is as well the possibility to sleep on the sofa-beds in the living room and so you can easily stay with 4 persons. All walls are decorated with art treasures. The kitchen is fully equipped and from here you get to the terrace with its fantastic sea view. From this terrace you come into the garden with another, big joint terrace and from here you reach after 100 meters beach and seaside. Even though this part of Famara Beach is not a „legal“ naturist beach it is expressly tolerated to be there naked. Caution: often you will find the red flags waving on the beach, they are warning signals of the dangerous current. Always keep contact with the ground when bathing! 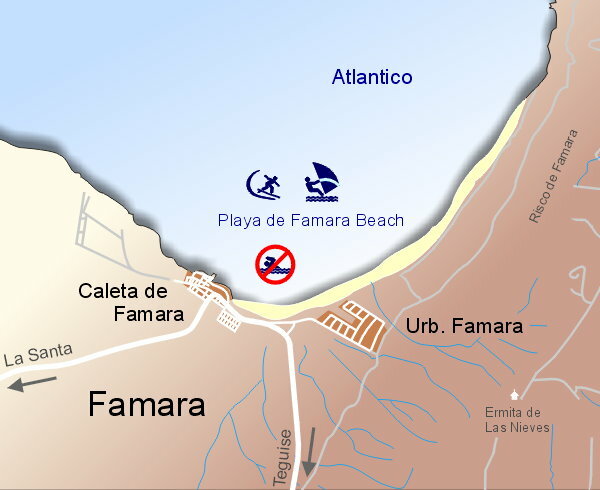 To the small village Caleta de Famara with restaurants, bars and supermarkets you only have to go 15 minutes or 3 minutes by car. But as well in the „Norwegian Settlement“ itself there is a supermarket and a restaurant, only 5 minutes to go. Bed linen and towels will be provided. Weekly bed linen and towel exchange if desired. Washing machine available. We can organize either the transfer from/to the airport or as well the car rental. 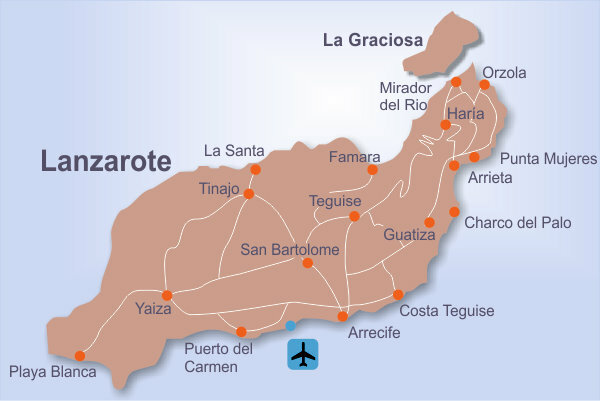 May be you are also interested in the following altenatives: Bungalow Famara, Casitas del Mar (Arrieta), Caleta Campo.